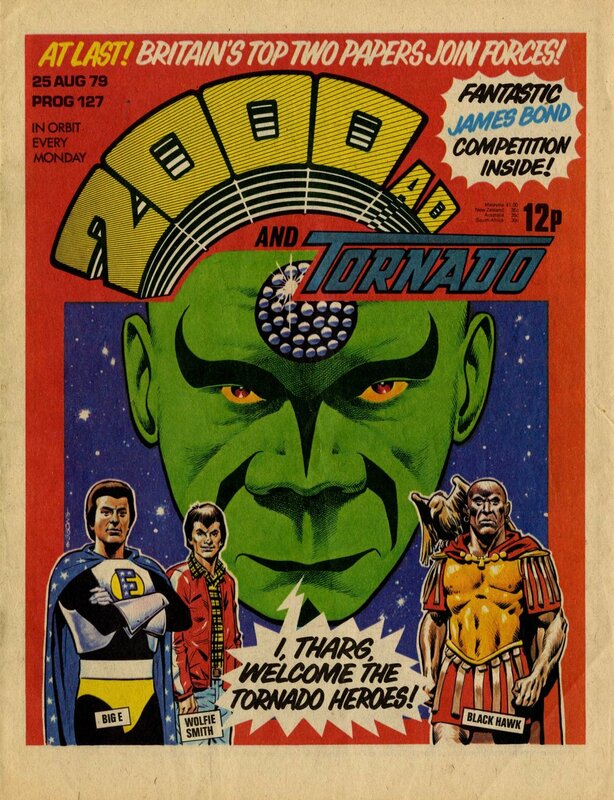 2000AD has taken in two sister comics during its 41-year history, both within the first two and a half years of its own lifetime. 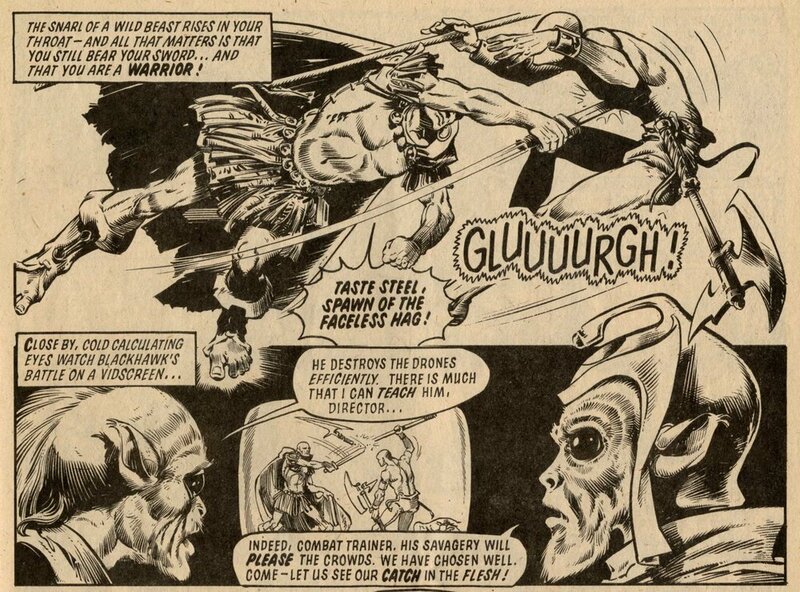 The first merger, with Starlord in October 1978 (http://www.greatnewsforallreaders.com/blog/2016/10/11/on-this-day-14-october-1978-2000ad-and-starlord), can be said to have had a significant influence on 2000AD’s development, introducing two of its most popular, long-running and best-known strips in Strontium Dog and Ro-busters (soon to transform into The A.B.C. Warriors). The second, with Tornado in August 1979, had less of an impact. 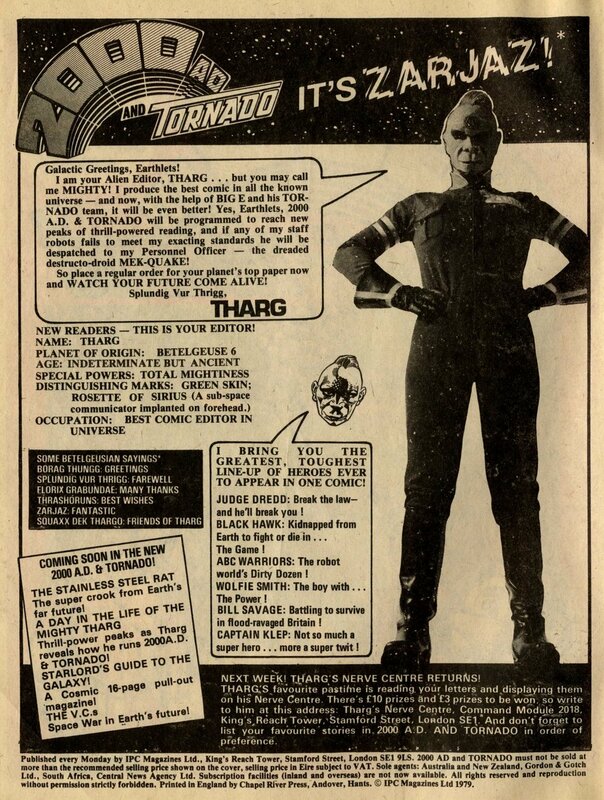 While Starlord shared 2000AD’s profile as a science-fiction comic, Tornado was a less obvious fit. It had been conceived, 22 issues earlier, as an action comic for boys with a loose connecting theme of ‘heroes’ (Heroes was mooted as its title at one early stage). As such there weren’t many obvious choices for stories to cross over into The Galaxy’s Greatest Comic. 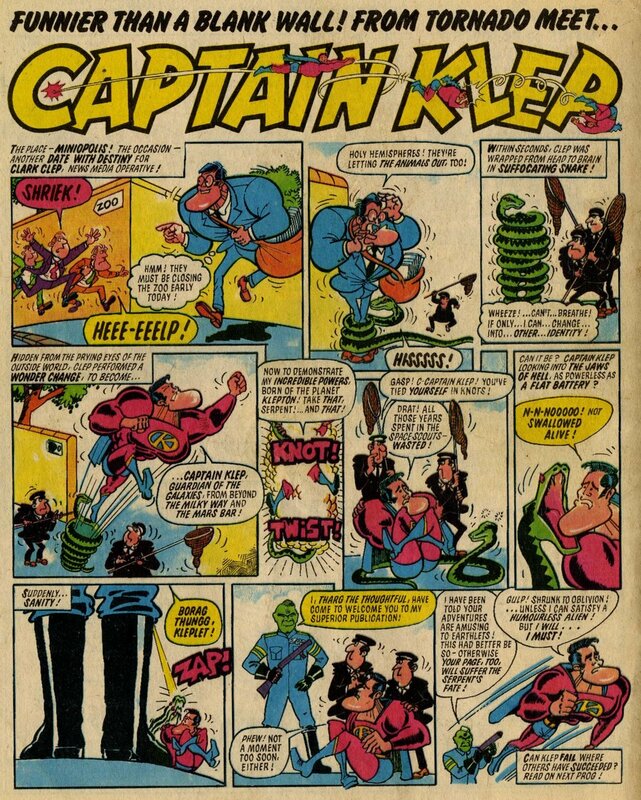 ‘Superheroes’ Captain Klep and Tornado’s editor ‘Big E’ carried little substance (I doubt either of them will be joining The Vigilant line-up any time soon). 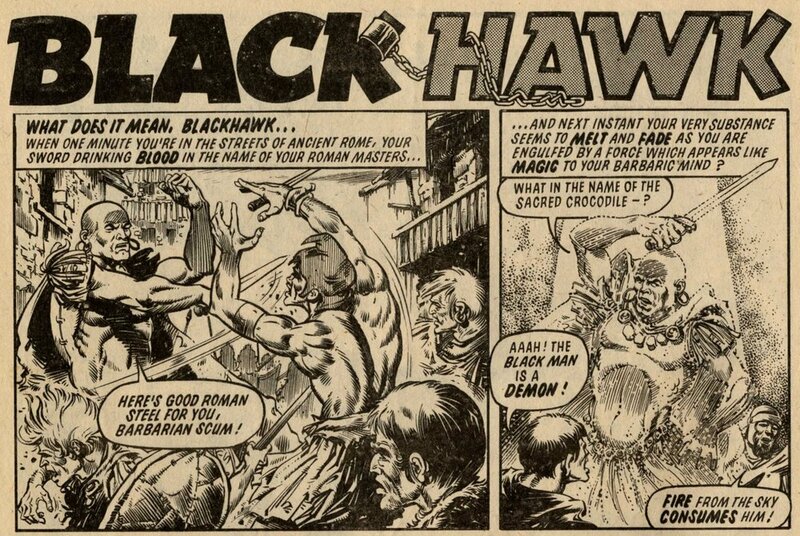 Black Hawk and The Mind of Wolfie Smith were reasonably strong strips in themselves and would both, perhaps, fit more comfortably as modern reinventions in 2000AD today, but the comic was purely sci-fi in 1979 so they seemed less obvious. Black Hawk was actually repurposed as a concept for this merger episode, the slave of the Roman Empire sucked from ancient history to become an interstellar gladiator. The creative line-ups were strong though - Alan Grant and Kelvin Gosnell (writing as Alvin Gaunt) scripted Black Hawk, with Massimo Belardinelli providing the artwork, while Tom Tully and Ian Gibson delivered Wolfie’s mental adventures. 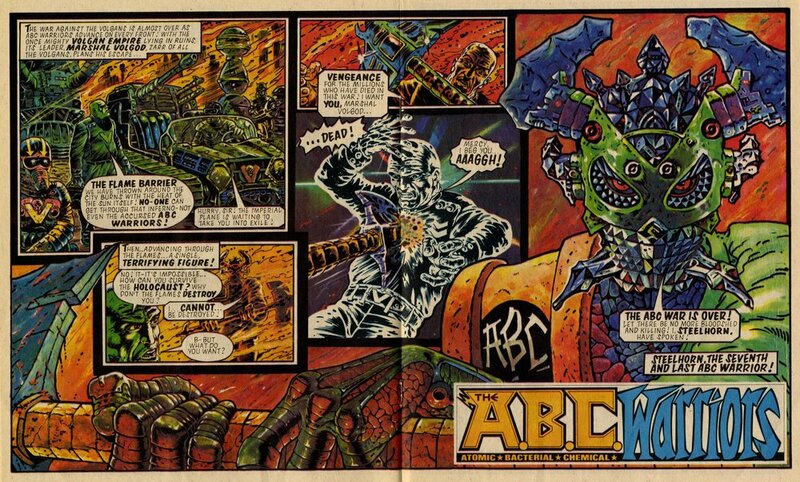 Dave Angus was the writer of Captain Klep (artist unidentified), and Dave Gibbons produced a smart cover to introduce the newbies ... including a likeness of himself as Big E.
Judge Dredd (featuring some superb Brian Bolland artwork to John Wagner’s script), The A.B.C. Warriors (Pat Mills and Brendan McCarthy, featuring Steelhorn’s disintegration into The Mess) and Disaster 1990 (Gerry Finley-Day and Carlos Pino) completed the line-up.